Digital-native enterprises make it look easy. Every facet of the business is seamlessly connected by a common data stream. Business flows, people collaborate, systems integrate. But, if you’re a conventional business with a vision of transforming to a digital operating model, you’ll need to break through legacy walls and leap beyond conventional divides. A key factor will be your ability to integrate digital and conventional IT groups. 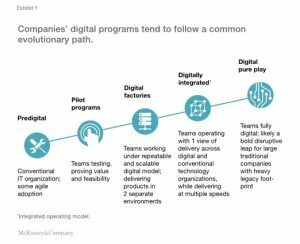 Many businesses dip their toes into the water of digital transformation by implementing a Digital Factory model focused on specific goals or challenges. The model serves as an incubator for new digital approaches. 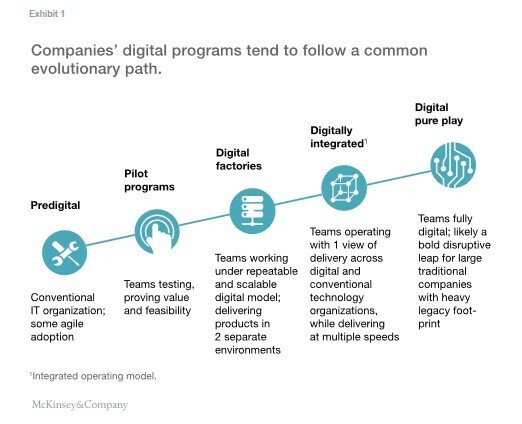 However, according to a report by McKinsey & Company, while companies may achieve short-term success with this approach, true and total transformation momentum cannot be sustained unless the digital technology group is integrated with the rest of the technology function. A better approach is an integrated digital IT operating model that presents one view of how technology capabilities are delivered. The report suggests that achieving this model can take years and will require the development of flexible, continually evolving enterprise architectures, agile data management practices, and a rethinking of the technology organization’s people and processes. How to succeed? Look for a digital transformation partner who can guide you through a long-term strategy, one with a digital platform capable of creating an open flexible, accessible product and data network that connects all stakeholders. Learn from the experiences of other business leaders who are well on their way to a digital transformation. Boeing, Ericsson and Scania are three companies who are finding success with the Dassault Systèmes 3DEXPERIENCE platform. Most importantly, start now. Transformation is neither quick nor easy – but it’s necessary if your enterprise is to survive and thrive in a rapidly evolving and highly competitive digital business environment. Read the McKinsey & Company report, and learn more about Dassault Systèmes customer experiences. This post was originally published By Stephen Chadwick on the https://compassmag.3ds.com/and is being reposted here.